Several interpretations of the photo have been offered: A skeptical interpretation by Ole Henningsen of Danish organization SUFOI, shared by skeptical Belgian group Caelestia, suggests that it was simply a cloud of smoke coming from local heating plant, see analysis Maj. Hans Petersen of the Danish Air Force (ret. ), researcher for UFO organization IGAP, concluded it was a true UFO. Michael Hesemann, German author of bestsellers on UFOs and religious mysteries, writes "The vaporizing effect is explained by scientists as being the result of the surface of the UFO being cooler than -180 degrees Celsius. Because of that, the surrounding air becomes liquid and flows toward the Earth." If I were to try to make the case that this is a true UFO based only on this photograph, I would link it to other reports of "mist" around UFOs. 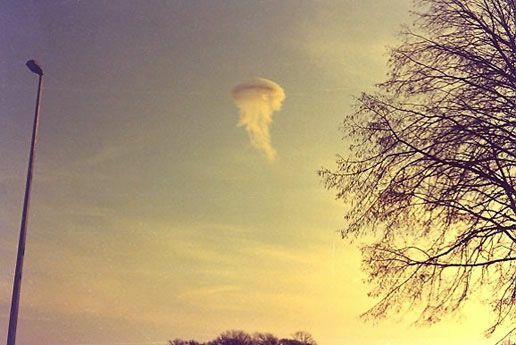 On many occasions UFOs are reported to become gradually engulfed in a vapor cloud. One such case can be found in James McCampbell's "Effects of UFOs upon people": A highway patrolman saw a strange object sitting on the ground in the San Joaquin Valley of California. It was early morning on a wintry day. Suddenly, the object became surrounded by a mist. Then a brilliant glow appeared as the object rose off the ground. The sudden appearance of mist in the San Joaquin case is a vital detail. That region in California is noted for very dense, ground fogs resulting from ground cooling due to radiant heat loss to the cosmos during long winter nights and high humidity near sloughs and swamps. Water vapor adjacent to the UFO could have been condensed by a reduction either in temperature or pressure. 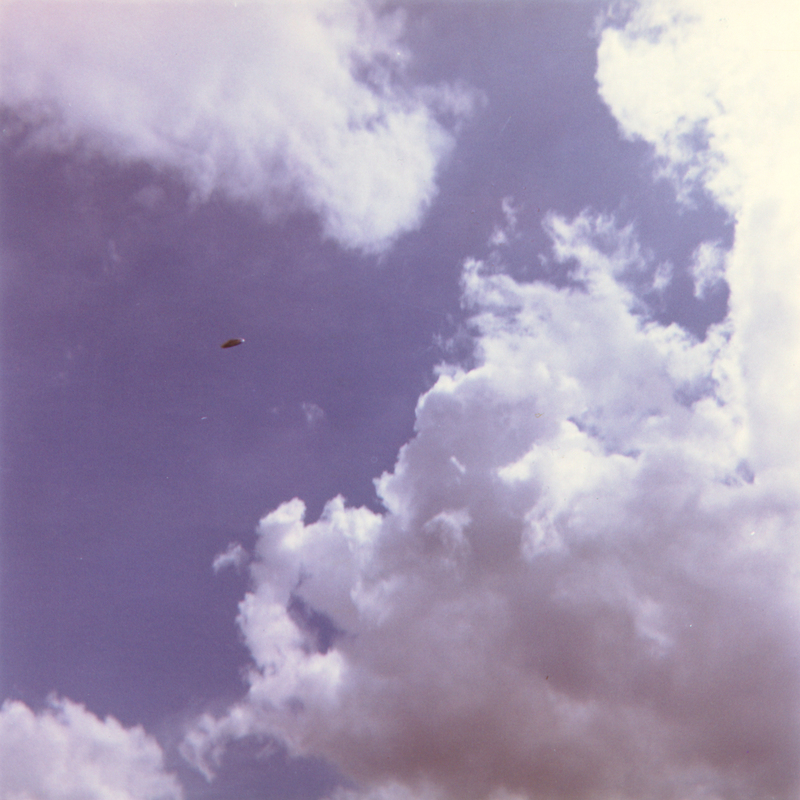 Story: UFO researcher Jean Bedet found this picture pinned with a note to his car windshield. The note explained that the photo was taken near Albiosc in the Vosges mountains in France at 11:30pm on 23-Mar-1974, by a witness who insisted on remaining anonymous. He was a medical doctor, who had seen the UFO as he was driving home late at night along a deserted country road, after visiting a patient. Typical UFO witness reports: "a glow surrounded the object" or "light appeared to be the entire outline of the craft". Full body luminosity is usually observed on UFOs in flight (typically visible at night or twilight). In rare cases it is observed in a landed UFO, however, in those cases, the object usually almost immediately engages in flight. Many different colours are observed, e.g. golden orange / yellow colour is seen at "low energy" mode of operation, when the object is stationary (hovering) or traveling very slowly. "The phenomenon of ionized and excited atmospheric molecules around a UFO also ties together a number of related mysteries about the UFO. It accounts for the general nighttime appearance of the UFO: the many observed colors, the fiery, neon-like look, the self-illuminating character, the fuzzy, indefinite or even indiscernible outline, yet an appearance of solidity behind the light. In the daytime the same plasma is present, but usually invisible. Morning and evening, it is partly visible. The ion sheath also accounts for some daytime UFO characteristics such as a shimmering haze, nebulosity of the atmosphere or even smoke-like effects sometimes observed. The absorption characteristics of the plasma can also partly account for the daytime hazy or smoky appearance of the atmosphere around the UFO. When the surrounding illumination is brighter than the plasma, the plasma absorption may be greater than its emission, making it look darker or hazy." Lynn, MA USA 11-Dec-2006 oval/egg shaped UFO Photos by Fredrick N., two photos taken with a digital camera. [full story and bigger photos] Note: The new CCD digital cameras have the ability to pickup nearly-visible and invisible light in the UV (ultraviolet) range. Some astute eye-witnesses will describe the optical effect as "black-light" (almost exclusively in the soft near ultraviolet range, and very little visible light). My kids and I saw this incredible UFO in the eastern sky on Dec 11th at around 5 pm. No sound just moving back forth up and down then exited. The witness seems to think it is a domed disk, probably because for most people that's what UFOs are supposed to look like. But the magnifications of his photos tell an interesting story. 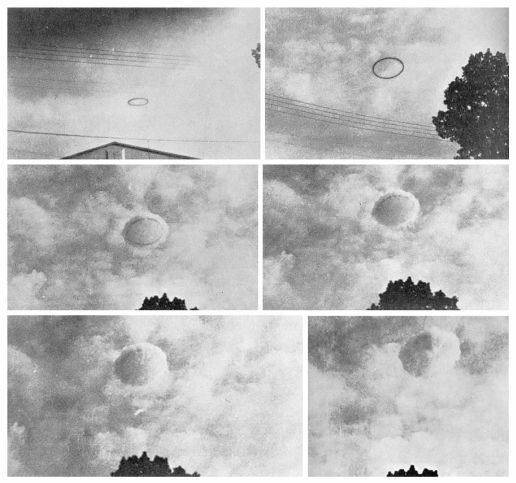 The 2 photographs show an oval/egg-shaped UFO (which is one of the common configurations seen near the ground) flying with the long axis vertical, with a noticeable luminous air-ionization around the underside. This illuminated and illuminating sheath of atmosphere around the UFO is a sheath of ionized and excited air molecules (also called a "plasma" in scient. literature). [more in UFO illumination and colors]. 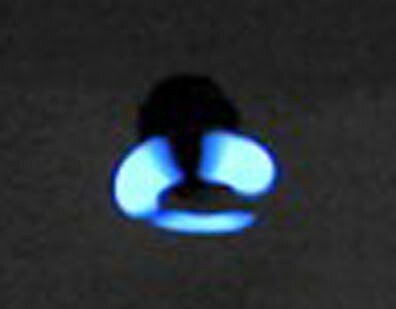 Related: This optical effect (often described as "exhaust fumes" by eye witnesses) is found in many other recent UFO photos shot with digital CCD cameras, e.g. one shot in Aug-2004 in Halkidiki, Greece. Because of the difficultly of creating plasma at normal atmospheric pressure and temperature, in addition to other confirming observations, such as a) the luminosity of some reported submarine UFOs and the physical effects as UFOs enter/exit the water b) the sudden appearance of "mist" around UFOs when they startup in high humidity environment, apparently as water vapor adjacent to the UFO is condensed by pressure from a force-field, and c) the occasional violent sound effects (roar) at startup, while being completely silent in flight it seems that UFOs create an envelope of lower atmospheric density near their surface, a vacuum, i.e. "push the air/water away" from the skin of the craft. Hill suggested a subsonic flow-pattern of streamlines around the craft. Another way to think of it is using the same principles as a light bulb: UFO craft is the filament and the bulb is the field around it, that protects the UFO, keeps the surrounding medium (air/water) from coming in touch with the UFO, which also minimizes friction and heating issues. Below: Notice in the #2 photo, the blue-ish neon-light-like glowing areas appear at some distance around the underside of this oval craft, spaced at seemingly 120° apart. It is not the UFO itself glowing but an envelope of ionized air around it (what Hill calls "plasma sheath"). [better visible in 2nd photo enlargement] It is believed that the UFOs' ionizing radiation is a secondary effect of the force-field propulsion system, in which case they reveal the direction of the thrust - "thrust-vector control". Story: The witness was sitting on the passenger's seat, taking landscape photographs under the rain when suddenly a luminous disk appeared. The photograph is from the UFO files of the French Gendarmerie Nationale. Even though photographed during daylight, there is a noticable luminous "ion cone" under the saucer, usually visible at night. Indeed this "ion cone" effect is commonly reported for saucers. As Paul Hill points out in his book, apparently air ionization is a secondary effect of the force field used for the UFO's propulsion system. "Most ground heating data is from saucer-type UFOs, and these are the ones known to focus their ionizing radiations downward with considerable accuracy, because of the observed saucer ion cones and saucer (landing) ring data." Related: Cases of similar flat-bottomed disks include the cases of e.g. Fregnale, Lac Chauvet - Auvergne France, 1952, Rogue River, USA 1949, as well as more recent cases e.g. Roberto di Sena, Alagamar Brazil, 26-Nov-2006, Redondo Beach, CA USA, 31-Mar-2007 and many more. Another photographic case is possibly of Rudi Nagora (although a 2006 paper by Dr.Haines suggests it may have been a triangle with rounded corners and a convex top), Styria Austria, 23-May-1971 (11 photos, see short story and photos, large 300dpi photo (1.5MB)). Todo: Add here the video interview of Russian Colonel Vyatkin Lev Mikhailovic (HistoryChannel "Russian Roswell" 34'48"), who describes an encounter with a disk-shaped UFO on 6-Aug-1967. His plane "shook" as its wing was hit by a "ray of light" emanating from the underside of the UFO above him. Keywords: UFO Propulsion and Energy generation, Gravitomagnetism (Gravitoelectromagnetism), experiments with rotating superconductors (e.g. by Podkletnov, Tajmar etc), fluid toroidal mass undergoing rotation (superfluid ferrofluid centrifuge). Edgar Fouche / mercury-based plasma vortex / TR3B Aurora black triangle. Extended Heim Theory (EHT), Electrogravitics / Thomas Townsend Brown / Biefeld-Brown effect, Field Resonance Propulsion, Field Dependant Propulsion, propellantless propulsion, MagnetoHydroDynamics (MagnetoAeroDynamics), Pulsed EM Propulsion, Zero Point Energy / ZPF / "dark energy", Casimir forces, Hutchison effect, Universons theory. There have been "thought experiments" on how UFOs might work (on paper, as no hardware is available, at least publicly). Books have been written by Paul R. Hill (written 1970s, published 1995), James McCampbell (1970s), Leonard G. Cramp (1966), Plantier (1953); who all approached the UFO phenomenon from a "nuts-and-bolts" craft perspective and their theories on UFO manoeuvring were based on the idea that a UFO's source of propulsion is rigidly attached to the craft. Other engineers and physicists who have shown a public and persistent interest in the UFO subject, or speculated on how UFOs might work, are Hermann Oberth, James E. McDonald, James Harder, Harley D. Rutledge, Jack Sarfatti, Harold Puthoff, Claude Poher (who in the late 1970s headed GEPAN, the French government's UFO project) and many others. This page is complementary to my Quick Technical Overview: What we think we know about UFOs page. Summary: If we are to explain UFOs in terms of physics we understand to some degree, yet still conform to witness observations, it seems essential to assume UFOs are capable of generating artificial gravity fields (in GR terms, to manipulate the curvature of the fabric of space-time), much as we produce magnetism with electric currents. An approximation -probably oversimplified- of overall UFO behaviour is via accepting such a (hypothetical, or at least not known to us) gravity-like repulsive "force-field". The glow / luminescence in various colours around the UFO (apparently shape depends on UFO's shape as well as its current maneuver, so the UFO's outline as seen by external observer can change), is thought to be due to ionization of surrounding air (atmosphere around the UFO "lights up", much like what happens in neon-lamps), hereafter referred to as "UFO plasma sheath". Brightness/color changes of the "UFO plasma sheath" seem to be related with thrust/acceleration. The air ionization seems to be caused by the EM radiation emitted by the UFO, and is thought to be a secondary effect of the propulsion system. This includes UV (suggested by many cases of sunburn-like effects and eye and skin irritation) and soft X-rays (suggested by "burn ring" traces on ground where UFOs landed). Considering the difficulty of creating plasma in normal atmospheric conditions, in combination with other observations, like the luminosity of submarine UFOs, the sudden appearance of condensation / mist when starting up in high humidity conditions and noise patterns, it all suggests an envelope of lower atmospheric density near the UFO's surface. A near vacuum, i.e. the air/water is "pushed away" from the skin of the craft (confirmed by observations when UFOs rise from water), which minimizes friction and heating issues. Plasmas can interact strongly with electromagnetic radiation, "Plasma Stealth" is a proposed process that uses ionized gas (plasma) to reduce the radar cross section (RCS) of an aircraft. This may explain why sometimes UFOs are seen visually, but not tracked on radar. Often UFOs have a very strong magnetic field. Also, in several cases, light (e.g. from car headlights or beaming spotlights) is reported to "bend" in front of the UFO, an effect which some suggest is related with the most controversial aspect of UFO reports: the apparent ability to disappear / "blink out" or seem to "implode" (diminish in angular size) [miniature-scale "gravitational lensing"-type phenomenon?]. Physiological effects on humans include: sunburn-type effect and eye irritation, extreme dryness of the nasal area and of the throat, color changes in vision, extreme headaches and a heating/burning sensation. Witnesses and animals have become sick and even died, with symptoms similar to radiation poisoning, after close approach to a UFO. Given the tremendous amount of energy UFOs seem to be expending, their power source is a big mystery. Many ideas have been proposed, including that UFOs are storing energy in a very concentrated form, or converting gravity to usable energy (H.Oberth 1950s), or utilising ambient energy (speculations about being able to tap the so-called Zero-Point-Energy) or utilize remote transmission of power (wireless energy transfer). It seems that UFOs defy our currently accepted Physics, e.g. the conservation of momentum (UFOs accelerate without throwing any material out the backside). Both Newton's gravity and General Relativity (Einstein's theory of gravitation), require the existence of "negative mass" (or energy) for antigravity to be possible. This has been a major hurdle to the study of UFOs by many "mainstream" physicists in previous decades (e.g. read Markowitz, W., "The Physics and Metaphysics of Unidentified Flying Objects", Science, Vol. 157, 1967). My opinion: Having spent considerable time researching the UFO subject, it seems to me that the public scientific research most promising to be related to the UFO propulsion question, is the so-called Gravitomagnetism (the subject of field effects caused by moving matter, it has nothing to do with magnetism despite its name) and in particular any connection of gravitation with superconductivity, the purported "enhanced or boosted Gravitomagnetism". I am inclined to also include claims made in the 1990s by Russian materials scientist E.Podkletnov of "gravity shielding" effects when experimenting with rotating superconductors in a magnetic field, characterised "controversial" and apparently had a negative effect to his carreer. In Mar-2006, an experiment by Austrian physicist M.Tajmar et al funded by ESA (European Space Agency), reported generation of a toroidal (tangential, azimuthal) gravitational field in a rotating accelerated (time dependent angular velocity) superconducting Niobium ring. My opinion stems from the fact that UFO literature since the 1940s consistently documents: 1/ direct gravity-like effects 2/ perception of rotation on UFOs, such as at the rim of saucer-/saturn-/sphere-shaped UFOs 3/ saucers flying in a manner as if the drive is acting perpendicular to the plane of the disk 4/ strong magnetic fields. The commonly observed UFO shapes (disk, spheroid) are seemingly not chosen for aerodynamic purposes (considering when discoid UFOs want to fly away fast, they tilt and fly with the plane of the disk directed forward). Very early in the UFO study, there was the idea that "saucers do their business at the rim" (APRO, Hill), the same area which generally is reported to rotate and glow. However, in this page I provide links to other ideas on possible UFO propulsion which have been proposed over the years, such as Magneto[Hydro/Aero]Dynamics (the most popular), to Pulsed EM, to mag-lev type levitation. To the degree that the engineering characteristics of UFOs can be estimated by empirical observation, in this reviewer's opinion the above-referenced, recently-published book by Paul Hill provides the most reliable, concise summary of engineering-type data available.1 The data were compiled over decades of research by a Chief Scientist-Manager at NASA Langley Research Center2 who acted as an informal clearinghouse for UFO-related data. The strength of the compilation lies in its thoughtful separation of wheat from chaff, and the analysis of the former into coherent patterns, including detailed calculations. Perhaps surprising to the casually interested, under careful examination the observations, rather than defying the laws of physics as naive interpretation might suggest, instead appear to be solidly commensurate with them, as the following discussion shows. One of the most consistently-observed characteristics of UFO flight is a ubiquitous pattern in which they tilt to perform all maneuvers. Specifically, they sit level to hover, tilt forward to move forward, tilt backward to stop, bank to turn, and descend by "falling-leaf" or "silver-dollar-wobble" motions. Detailed analysis by Hill shows that such motion is inconsistent with aerodynamic requirements, but totally consistent with some form of repulsive force-field propulsion. Not satisfied with paper analyses alone, Hill arranged to have various forms of jet-supported and rotor-supported circular flying platforms built and tested. Hill himself acted as test pilot in early, originally-classified, versions, and found the above motions the most economical for control purposes. Pictures of these platforms are included in the text. In an effort to examine the force-field propulsion hypothesis yet further, Hill analyzed a number of cases involving near-field interactions with an apparent craft in which some form of force was in evidence. These include examples in which a person or vehicle was affected, tree branches were parted or broken, roof tiles were dislodged, objects were deflected and ground or water were disturbed. Under close analysis the subtleties of these interactions combine to point unequivocally to a repulsive force field surrounding the craft, while discriminating against propulsion mechanisms involving jet action, pure electric or magnetic effects, or the emission of energetic particles or radiation (although the latter may accompany the propulsive mechanism as a secondary effect). Further detailed investigation indicates that the particular form of force field propulsion that satisfied observational constraints is what Hill labels a directed acceleration field; that is, a field that is, in general, gravitational-like in nature, and, in particular, gravity-canceling.3 Such a field acts on all masses in its sphere of influence as does a gravitational field. Corollary to this conclusion is that observed accelerations ~100g relative to the environment could be sustained without on-board high-g forces. One of the consequences of the above identification of field propulsion type by Hill is his conclusion, supported by detailed calculation, computer simulation and wind-tunnel studies, that supersonic flight through the atmosphere without sonic booms is easily engineered. Manipulation of the acceleration-type force field would, even at supersonic speeds, result in a constant-pressure, compression-free zone without shockwave in which the vehicle is surrounded by a subsonic flow-pattern of streamlines, and subsonic velocity ratios. An additional benefit of such field control is that drops of moisture, rain, dust, insects, or other low-velocity objects would follow streamline paths around the craft rather than impact it. Another puzzle resolved by Hill's analysis is that craft observed to travel continuously at Mach 4 or 5 do not appear to generate temperatures sufficiently high to be destructive to known materials. In other words, UFOs appear to prevent high aerodynamic heating rates rather than permitting a heating problem to arise, then surviving it with heat-resistant materials as is the case of the NASA Space Shuttle, whose surface temperatures can reach 1300°C. The resolution of this potential problem is shown by Hill to derive from the fact that the force-field control that results in the prevention of shockwave drag as discussed above is also effective in preventing aerodynamic heating. In effect the airflow approaches, then springs away from the craft, depositing no energy in the process. A further example of the type of correlation that emerges from Hill's analytical approach is provided by an analysis of the economy of various flight-path profiles. It is shown that high-angle, high-acceleration departures on ballistic-arc trajectories with high-speed coast segments are more efficient than, for example, intermediate-level, horizontal-path trips, both in terms of required impulse-per-unit-mass and time-of-flight parameters. This he correlates with the observation that UFO departures are of the dramatically high-angle, high-acceleration type. Also of interest is Hill's analysis of the spectra and intensity of an apparent plasma sheath surrounding such craft, the details of which correlate with what one would expect in terms of it being a secondary effect associated with the propulsion system; for example, a blue shift and intensity increase during a "power-up" phase, and the opposite during hover and landing maneuvers. An additional fine point that emerges from this analysis is resolution of the paradox that observation on a direct line-of-sight to a near part of the craft can reveal a metallic-like structure while the attempt to observe the outline of the craft, necessarily by an oblique line-of-sight, results in an indistinct blur. Analysis shows this to be a reasonable outcome of an expected re-absorption of reflected light by the surrounding plasma in the longer-length path associated with the more oblique view. Additional calculations concerning the parameters of interstellar travel (including relativistic effects), and the energetics of such travel, have been performed and are included in tabular and graphical form. The wealth of material in these sections, along with discussion of the broad implications of this material, reveal the dedication and thoroughness of Hill's approach to his self-assigned task. In the final analysis, one must conclude that Hill has assembled as good a case as can be made on the basis of presently available data that the observation of some "unconventional flying objects" is compatible with the presence of engineered platforms weighing in at something around 30 tons, which are capable of 100-g accelerations and 9000-mph speeds in the atmosphere. Perhaps more important for the technical reader, however, is Hill's supporting argumentation, based on solid analysis, that these platforms, although exhibiting the application of physics and engineering principles clearly beyond our present-day capabilities, do not appear to defy these principles in any fundamental way. 1 The book also comes highly recommended in a Frontispiece by Apollo 14 astronaut Edgar Mitchell, Ph.D. and in a Foreword by retired McDonnell Douglas R&D Manager, Robert M. Wood, Ph.D.
2 Asst Chief, Pilotless Aircraft Research Div., Assoc. Chief Applied Materials and Physics Div. Retired from NASA in 1970. 3 Recent examples of the discussion of the technical aspects of candidate field propulsion mechanisms of this type are given in M. Alcubierre, "The Warp Drive: hyper-fast travel within general relativity," Class and Quantum Grav. 11, L73 (1994), and in H. Puthoff, "SETI, the velocity-of -light limitation and the Alcubierre Warp Drive: An integrating overview," Phys. Essays 9, No. 1, 156 (March 1996). This book review originally appeared in the Journal of Scientific Exploration, Vol. 10 No. 4, 1996. There are at least four highly interesting radar/visual cases which are well documented. The Coyne UH-1H helicopter-UFO encounter 1973 (occured at the start of a major UFO wave that was happening in the USA in the latter part of 1973 to early 1974) which was a situation wherein a helicopter and its crew were apparently moved from about 1,500ft to 3,500ft of altitude in a time of a few seconds without any feeling of acceleration by the crew. More: ufologie, ufoevidence, nicap, cufon foia. Also note that the UFO was last seen moving towards Lake Erie, i.e. the UFO-water connection I keep highlighting throughout these pages. Wanaque, New Jersey Jan-1966, which was the site of a report involving the rising of water by a foot or so directly under the UFO. Many reports of cases of levitation (ref: Bob Pratt's work in Brazil). Rotation of the plane of polarization of light (ref: Dr. Harder presented the Webb 5-May-1953 case in the 1968 Congressional hearings - src1 src2). Many night-time UFO photos once developed show just a mesh of colorful "squiggly lines of light" (e.g. stills from the recent Stephenville, Texas USA Jan-2008 video, the "ambersand UFO" of the famous sightings at New Zealand Dec-1978, night-time photos taken in the Smoky Mountains National Park in Feb-2008 or those taken in 1999 by Rhonda Rose, filmed near the Columbia River, close to Hood River, Oregon pic1, pic2). It is my suspicion that what is perceived as "jitter" and "shape-shifting", the eyewitness reports of apparent change in UFOs' angular diameter ("winked out, from the outer edges inward", "seemed to implode, it shrank, and at a higher level it reappeared again") and the reports of UFO bending light (e.g. of car headlights) and fading / invisibility phenomena (covered in other pages), might be connected. A strong magnetic field might saturate the ignition coil and reduce voltage to the spark plugs. Joe Kirk Thomas, while employed as a EM interference engineer, did some experiments which led him to believe that "interference with automotive ignition systems could occur at magnetic field levels (at the point of interference) of 0.1 Tesla / 1000 Gauss and frequency of 100 Hz." (src: MUFON Journal Sep-1987, Oct-1989) Under this scenario, automobiles with diesel engines are immune to being stalled by the proximity of a UFO, because diesel engines do not utilize a high voltage ignition system. Another idea, suggested by J.McCampbell, was that the ionization of air around the UFO. Once ionized to form a plasma, air loses its normal insulating properties and will conduct electricity at lower voltages (commonly referred to as the insulator 'breakdown voltage') and thus short-circuits the high-voltage part of the ignition. Note: could this be related to the "tingling sensation", "hair stood up on end" etc physiological effects reported by human witnesses?. More (from MUFON 1983 Symposium proceeding). Magnetic effects (e.g. compass swinging wildly, even a case of compass reversing polarity): Fifty-six (56) aircraft pilot sightings involving EM effects by Richard Haines, Ph.D. Often electrical circuitry and radio communications are interrupted, batteries are burned out. Strong Magnetic Field detected follwing sighting of a UFO by B. Maccabee, Ph.D, 1994,2000. "Following the brief sighting of an unidentified flying object in Gulf Breeze, Florida in September 1992, investigators made an area search using a fluxgate gradient magnetometer and found a strong magnetic field gradient, indicative of a strong source of magnetic field, which appeared to be at or above the tops of some trees near a small pond. Three circles of depressed grass were found in the bottom of the shallow pond. This paper discusses the sighting, the area search, the circles and the field gradient measurements. An estimate of the field strength is presented and compared with magnetic effects associated with other sightings." one could assume that radar operators are under instructions to not report them, nor write anything down and basically to lie to eye-witnesses who ask for radar confirmation of what they see with their lying eyes. Nevertheless, it seems that sometimes UFOs are seen visually, but not tracked on radar e.g. enlisted men who served in one of the major military radar installations here in Greece, on island Samos, reported (privately, but these are not carreer military officers who would fear their pensions) that on at least one occasion they could see a UFO do erratic maneuvres for minutes, yet their radar didn't log anything. "Plasma Stealth" is a proposed process that uses ionized gas (plasma) to reduce the radar cross section (RCS) of an aircraft. This may explain why sometimes UFOs are seen visually, but not tracked on radar. BTW there is speculation that USA's B-2 stealth bomber is using "plasma stealth". Such a vessel would be able to move at the most terrifying speeds without noise, and to break the sonic barrier without producing the 'sonic boom.' For the force field centered on the engine would also act on the surrounding air. The air molecules would be dragged along at speeds proportional to their proximity to the engine. As a result, whatever may be the real speed of the craft, its speed with respect to the nearest molecules will always be much less than the speed of sound; these molecules in their turn will travel more slowly than the engine, but more rapidly than the molecules of the next layer, and so on. Thus no relative supersonic speed will be observed, even if the engine is traveling at 20,000 miles per hour. This reasoning seems perfectly logical: what causes the strident noise typical of supersonic aircraft, and the 'boom' of the sound barrier, is their continuous impact against the motionless air. But according to Plantier's reasoning, the air is drawn along at a distance by the engine, so that there is never any shock, but a gliding upon one another of the successive layers. For the same reason, the machine would be able to travel through the atmosphere at enormous speeds without overheating: the frictional heat, instead of being concentrated on the skin of the vessel, would be dispersed in the vast volume of air drawn along by the force field. Along the same lines are the theories of Cramp, McCampbell and Hill: some form of acceleration-type field is used to push aside air well ahead of the craft, streamlining the air flow, and allowing the craft to slice through the partial vacuum created with a minimum of friction and noise. Hill (a famous aerodynamicist in his day) mathematically demonstrated how a supersonic shock wave would be converted to subsonic airflow using such a system. 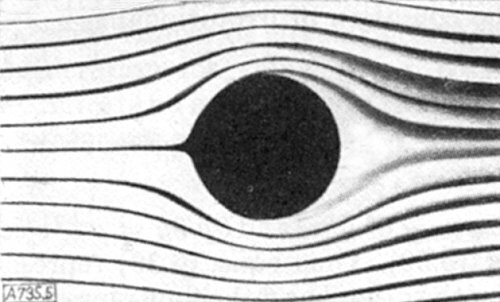 Like Plantier, Oberth and Hill believed saucers used a still-unknown acceleration-type field to accomplish this. Lt Plantier of the French Air Force, first published his theory in "La Revue Mensuelle de l'Armee de l'Air," #84, September 1953, the monthly review of the French Air Forces. - ufologie rr0. He further developed it in his book "The Propulsion of the Flying saucers," Mame, Paris. "UFOs are propelled by distorting the gravitational field, converting gravity into useable energy. With the ability to create their own gravitational fields, UFOs would be able to do all the things witnesses had attributed to them: hover motionlessly, accelerate at tremendous speed, make violent turns that would cause ordinary craft to disintegrate. Dr.Paul Santorini: Greek physicist, "Manhattan Project" scientist (Santorini had been a developer of the proximity fuse on the first A-bomb and held patents on guidance systems for Nike missiles and radar systems), born 1893 died 1986. He researched UFOs in Greece in 1947, after several sightings over Thessaloniki (my town) on 1-Sep-1946, thought to be Russian missiles flying over Greece. In a Feb-1966 interview to journalist K.Meraneos of national TV/Radio, he reported that "Ghost rocket" UFOs investigation in Greece was stopped and results were suppressed, after intervention by "foreign officials" (USA). He also refers to French Plantier and his hypothetical gravity-like "Plantier force" and his "flying saucer physics" are very close to the ones outlined by Paul R. Hill. Rho Sigma [Rolf Schaffranke] "Ether-Technology: A Rational Approach to Gravity Control" (.PDF, amazon). The anonymous "Rho Sigma" writes about devices and electrogravitic theory, overunity devices and UFO physics. "Theory of Universons" by Claude Poher, PhD [English/French] (registration needed). Poher, in 1977, created and headed GEPAN, the official French UFO project at CNES. The UFO must follow a self-generated self-steered timelike geodesic so that there is complete free float weightlessness inside it for all objects in it with small tidal force. 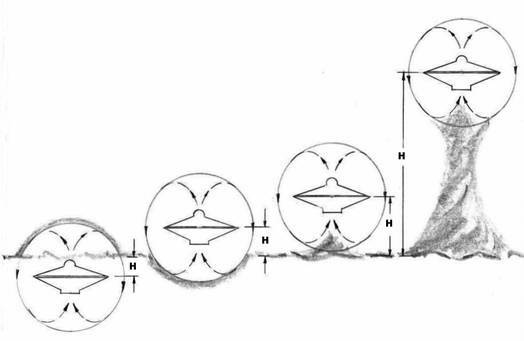 This is Paul Hill's "acceleration field propulsion" seen in Alcubierre's warp drive. How to make the exotic support regions is the key of course. Antigravity and conventional physics: In both Newton's law of gravitation and the general theory of relativity (Einstein's theory of gravitation), a requirement for antigravity to be possible is the existence of negative mass. Most scientists regard negative mass as a purely hypothetical concept with no basis in reality. A related idea that has been discussed by theoretical physicists involves gravitational shielding. Inside the circular air frame, place the mercury-engine with its solar mercury boiler at the aircraft center. By means of the power latent in the heated mercury which sets the driving whirlwind in motion a man sitting inside may travel a great distance in a most marvellous manner. Four strong mercury containers must be built into the interior structure. When these have been heated by fire through solar or other sources the Vimana (aircraft) develops thunder-power through the mercury. "A circular, plasma filled accelerator ring called the Magnetic Field Disrupter, surrounds the rotatable crew compartment and is far ahead of any imaginable technology... The plasma, mercury based, is pressurized at 250,000 atmospheres at a temperature of 150 degrees Kelvin, and accelerated to 50,000 rpm to create a super-conductive plasma with the resulting gravity disruption"
Other online resources about possible UFO propulsion system, BUT based only on Physics we know, of pure electric or magnetic effetcs on charged matter (i.e. without resorting to the hypothetical "force field" / "antigravity"). Such are Magneto-[Hydro/Aero]-Dynamics-based, i.e. ionize the ambient medium (air / water) and then work with magnetic fields. This includes the recent July-2008 announcement of an experimental "Wingless Electromagnetic Air Vehicle" (WEAV) by scientist Subrata Roy of the University of Florida. Purely magnetic effects, i.e. a magnetic field, that repells the Earth's natural magnetism. This might hypothetically be via room-temperature superconductors, that may have magnetic fields on the order of 10^6 Gauss (i.e. over a million times higher than the Earth's natural magnetic field) and "mag-lev train"-type modus operandi. This was the assumption of Canadian government's UFO project "MAGNET", run by engineer Wilbert Smith between 1950-1954. Also Dr Pajak "magnetocraft". Dr. Auguste Meessen Belgian, professor of Physics at the Catholic University of Louvain and Ufo researcher, formulated a "Pulsed EM Propulsion" model. It involves the action of electric and magnetic fields on electric charges, resulting from an adequate ionization of the ambient air. He also shows how the required, extremely intense, but low frequency field can be produced. Stanton Friedman on UFO propulsion - again MagnetoAeroDynamics (i.e. ionize the surrounding medium and then work with electromagnetic fields), gives the example of the EM submarine tested in Santa Barbara, CA in 1966. In the mid-1960s and electromagnetic submarine designed by Dr. Stuart Way, who was on leave from Westinghouse Research Laboratory, was successfully tested. It made use of the fact that electric and magnetic fields at right angles to each other produce a (Lorentz) force at right angles to both. The force pushes against the surrounding electromagnetically conducting fluid (seawater) which pushes back and moves the submarine. It is possible to envision an airborne analog in which seawater is replaced by ionized electrically conducting air, and conventional electromagnetic fields are produced by superconducting magnets which need little space, very little power and weight, and generate very high magnetic fields. Substantial research, much of it classified, has been done showing that a magnetoaerodynamic system would be capable of solving all the problems of high-speed flight by controlling lift, drag, heating, and sonic-boom production--all electromagnetically rather than mechanically or chemically. The resulting system would be symmetric, highly maneuverable, relatively silent, often have a glow around it, and be capable of sudden starts and stops. It could carry its own power supply or be charged up on board its mother ship in much the same manner as a golf cart which carries only a storage battery. There is current fundamental research work by Jack Sarfatti, Harold Puthoff, Bernard Haisch (calphysics.org), Eric Davis, Mark Pesses, Rueda, Tom Valone, Gennady Shipov, Michio Kaku. Sarfatti in his book "Super Cosmos" (2005) has the most detailed "theory" based on the recent discovery of the repulsive anti-gravity field "dark energy" (of the matter+energy content in the universe, ~73% is made of "dark energy", 23% "cold dark matter" and 4% atoms) that is accelerating the expansion of the 3D space of our universe. Sarfatti also cites Alcubierre's weightless warp drive without time dilation as essential conditions for "propellantless propulsion" in what Puthoff has called "metric engineering." Sarfatti's key idea is that the ship is able to control its own zero-g force geodesic flight path using small amounts of energy. This is controversial ofcourse, but he does have a paper on the physics archive with the mathematics of his theory. Kaku writes of "Type IV" advanced civilization supertechnology that is close to Puthoff's idea of "metric engineering" the fabric of spacetime itself. The mysterious dark energy, which has puzzled astrophysicists, is actually "zero-point vacuum fluctuations with positive energy density and negative quantum pressure. Dark matter is the same, but with negative energy density and positive pressure. Zero-point energy is 96 percent of all the "stuff" in our visible universe. What controls the sign of the zero point energy density at a given place and time and at a given scale of resolution? That is the 64 trillion dollar question, whose solution is the key to the metric engineering of weightless warp drive and star-gate wormholes. Field Resonance Propulsion concept HOLT, A. C. (NASA, Johnson Space Center, Houston, Tex.) AIAA-1980-1233 SAE, and ASME, Joint Propulsion Conference, 16th, Hartford, Conn., June 30-July 2, 1980, AIAA 8 p.
StarDrive.org UFOs and the new physics by physicist Jack Sarfatti, Ph.D.
UFO propulsion - asymmetric field density theory, 2nd part a bit long-winded, but interesting read. Wrong in most parts regarding UFO occupants and similar speculations, so just skip the first half. Dr. Jaynes New Science dedicated to research in Free Energy, Anti-Gravity, and New Science. You are welcome to subscribe (free) to the UFO Updates RSS feed. If you enjoyed this page, you are welcome to link to it from your Website or Blog, or add it to "social bookmarking" services so others can find it too.